It has been forecasted that the Construction PMI will come out strong and will support GBP, however, on the other hand, the US is also publishing strong economic reports. 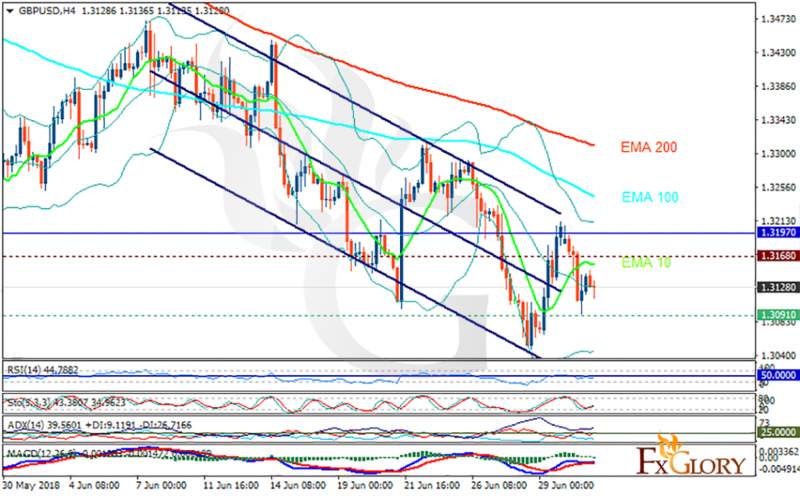 The support rests at 1.30910 with resistance at 1.31680 which both lines are below the weekly pivot point at 1.31970. The EMA of 10 is moving with bearish bias in the descendant channel and it is below the EMA of 200 and the EMA of 100. The RSI is moving below the 50 level, the Stochastic is moving in low ranges and MACD line is above the signal line in the positive territory. The ADX is showing sharp downward trend. The support level breakdown will push the pair down towards the lower Bollinger band, otherwise, it will grow towards 1.32.